The Gloriosa Lily is a superb tropical bloomer that will flourish just about anywhere in Australia. It is grown from a tuber and needs a sunny spot, sheltered from the wind with some sort of support eg, stake, netting, chicken wire, as it uses tendrils at the ends of its leaves to hold on. It can grow up to 1.8 metres tall. After flowering in summer the plant gradually dies off and the tubers should be dug and stored over winter. It can be planted in the garden or as a pot plant. Gloriosa rothschildiana is native to tropical Africa. It is the national flower of Zimbabwe, where it is known as "the flame lily". The large claw-like flowers open yellow and watermelon red then change to a rich claret edged with gold. Their fascination lies in the way the pendulous buds turn up in a 180 degree curve and then down again. 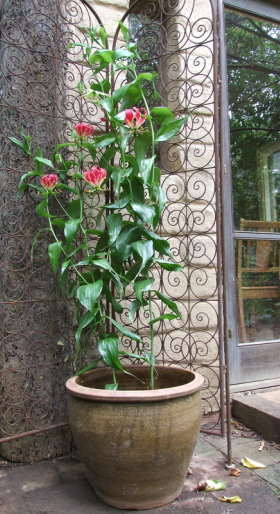 Gloriosa can be planted from October to December and is guaranteed to flower in its first year. A mature tuber can give up to 25 flowers. It is a very successful cut flower that can last up to two weeks. 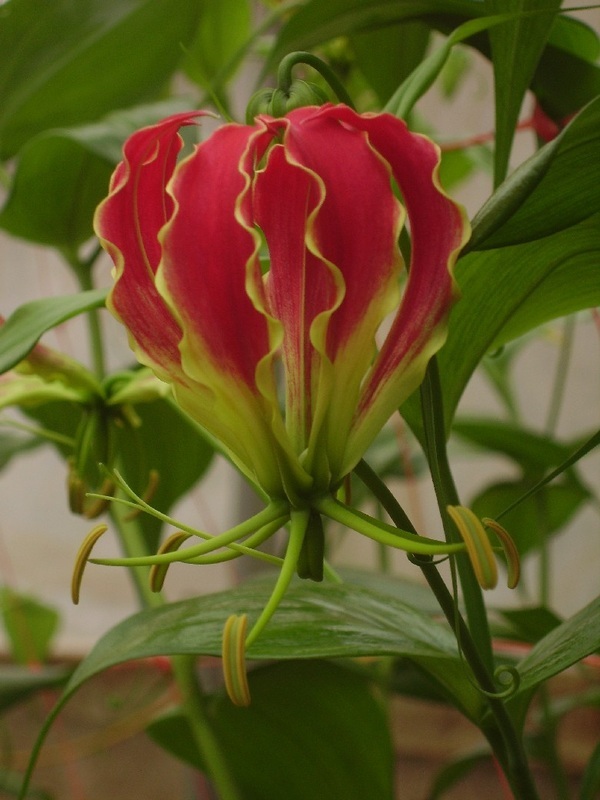 Gloriosa rothschildiana tubers can be pre-ordered at any time. They are dispatched during October-November for immediate planting. Tubers can be sent only to Victoria, New South Wales & South Australia due to quarantine regulations. Order via paypal or download our order form and fax or mail it to us. You can also order by telephone. This is for sales within Australia only. For sales outside Australia please contact us.